Over the past few years I’ve been having a lot of fun creating fairy gardens – darling little miniature gardens complete with miniature accessories, fairy-scale plants and plenty of whimsy. So needless to say, I have lots of fairy garden ideas to share with you! 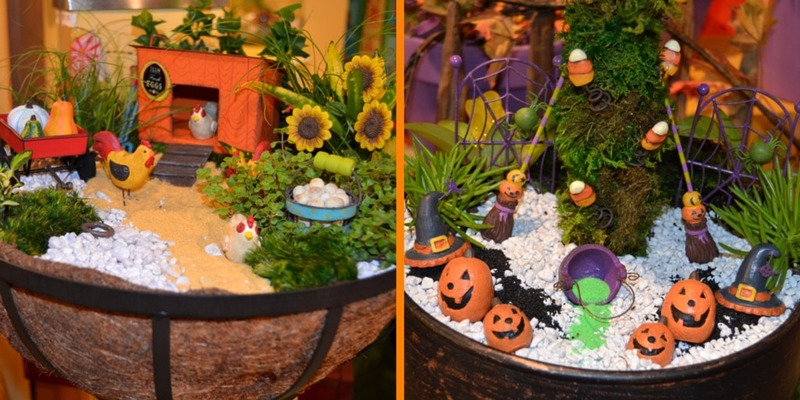 Although many fairy gardens are designed around “year-round” themes, I also think it’s fun to create them based on a particular season or holiday, such as Fall or Halloween. To me it’s just a natural extension of the seasonal themes I like to use throughout my home. Pick a Container – You can use anything from a terra cotta pot (perhaps in orange or brown to reflect the colors of the fall leaves) to recycled old décor pieces, such as a basket, miniature wheelbarrow, plastic jack-o-lantern or cornucopia. As long as your container has drainage and at least a 12” opening, the sky really is the limit regarding where you can plant your miniature garden. Create a Focal Point – One of the most important fairy garden ideas that I want to share is that having a captivating focal point really makes a big difference for the finished piece. Baker’s Village has a wide variety of miniature architectural pieces available that are perfect for this, such as gazebos, arbors, bridges and houses. Add Whimsy & Life to the Scene – Remember, you’re not just creating a miniature garden. You’re creating an imaginary home for fairies. To make the scene inviting you can add miniature fairy figurines in autumn hues, or animal figurines, such as deer, birds, bunnies, squirrels and raccoons. 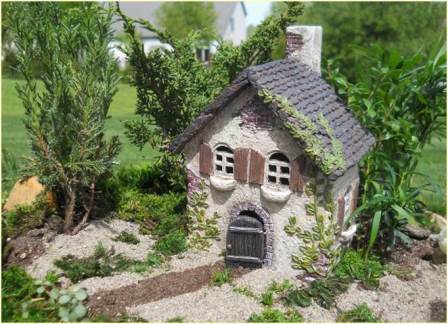 Add the Plants – To keep everything in scale you need to carefully choose miniature plants for your fairy garden. It’s okay to transplant or re-use existing plants from other miniature gardens that you created before. And if you don’t want to use live plants, miniature-sized silk stems are always an option, and preserved green sheet moss makes a nice “grass” look. If you do want to add live plants (which is always my preference! 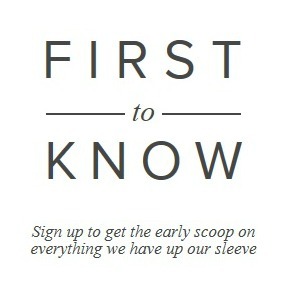 ), you might want to try some of the following. All of these work well as miniature plants for fairy gardens. Build Pathways – You can use small white pebbles to create a pathway from the edge of the pot to your focal point. If you do this, black sand makes a great color contrast next to the white pebbles if you’re creating a Halloween-themed miniature garden. Just use your imagination and create something that you think the fairies will like! Add Seasonal Items – The final step is to add in the seasonal items that will make your fairy garden perfect for Fall, Halloween, or whatever holiday or season you want to focus on. For a Halloween theme you might want to add in miniature pumpkins and Jack-O-Lanterns (try nesting them in low-growing foliage), ghosts, tombstones, monsters, skeletons, witch brooms and cauldrons, etc. Spanish moss draped around a container helps create a spooky feeling, and you can also use some of that “fake spider web” material that’s available at the stores this time of year.A Fall-themed miniature garden might feature scarecrows, miniature fall wreaths, miniature gourds and frolicking dogs. It’s always nice to include seating for the fairies as well! 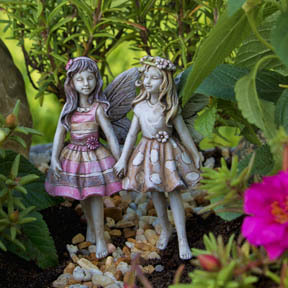 For inspiration, try perusing the fairy gardening section of our website or store. Need helping picking the perfect accessories or miniature plants for your fairy garden? Come on into the store! The Baker’s Village staff will be glad to help you. So cute. Wanting to receive by the 23rd of nov. Is this possible with standard shipping? 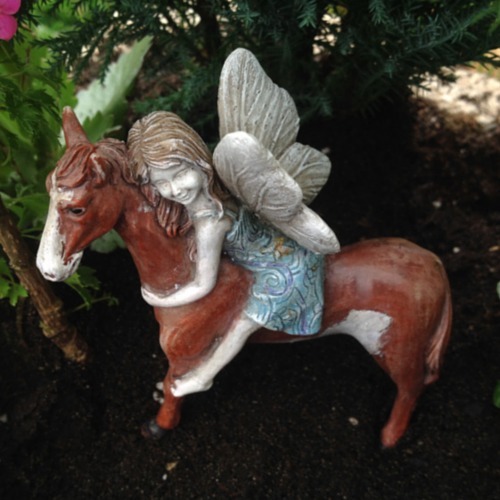 Hi Mary Kelley- We ship our fairy items out within 48 hours of when we receive them. Yes, you would receive by Nov 23rd.